Pro Tools users now have the ability to use a custom editing keyboard without having to attach an external keyboard! 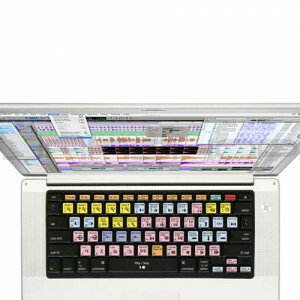 Pro Tools users can simply put on our custom shortcut keyboard cover and start editing in Pro Tools right away… anywhere! With our exclusive covers, your Pro Tools projects will get edited faster because you can spend more time working on your project and less time memorizing the program shortcut keys. The Editors Keys Pro Tools Keyboard Cover includes custom editing buttons for the default keyboard layout for Pro Tools and is compatible with all versions including Pro Tools HD, LE, M-Powered and Free. Utilizing a 9-color printing process, the editing keys are color-coded and heat fused to ensure long lasting durability. This keyboard set is also compatible with all three of the MacBook range (MacBook / MacBook Air and the newly released MacBook Pro. ), so if you move to a different laptop, you can now take the cover with you. Each cover is printed with a QWERTY layout so please make sure your keyboard is designed for this layout. They are designed to not slip or slide and have a silky smooth feel that is soft and comfortable to the touch and will not restrict typing. Keep your laptop clean and in perfect condition, but the Editors Keys editing cover now.